Average ratio of fluxes on the CALSPEC scale to GALEX fluxes. The red diamonds connected by a dotted line are the results from a direct comparison of CALSPEC to GALEX from Section 2, while the red diamonds connected by a solid line are the ratios from Section 3 of the corrected IUE fluxes to GALEX. The black squares with 1σ error bars are the weighted average correction. 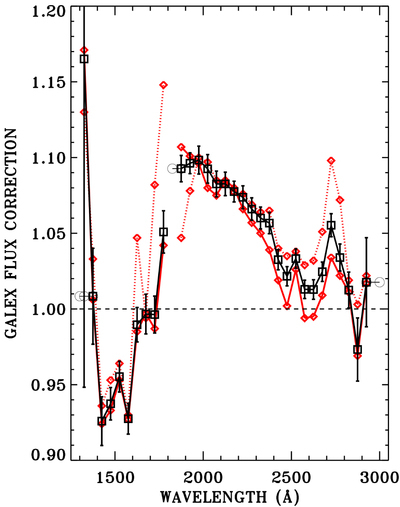 GALEX fluxes should be multiplied by this average correction from Table 3 to be on the HST/CALSPEC scale. Open circles near the endpoints of the corrections are explained in the text.